In keeping with my previous post about a recipe cooking with goat cheese, I felt it was only appropriate to post here my latest magazine article (which will come out online in a few days) about making goat cheese at home. I kept the piece in its original magazine style, to give you a taste of my more “professional” writing style. Tangy flavor, velvety texture, and versatility make it loved by the masses and easy to incorporate into so many meals. It has the intrinsic ability to class up any meal, with a name like Chèvre, it’s not hard to believe. It would not be too bold to say it may just be one of the most addicting cheeses in existence. However, as with most fine things in life, the average price for a package of goat cheese can be a bit high considering the amount being bought. Niederlander, and others who feel this pain need not to fear, because perhaps the best part about goat cheese is the fact that it can be made at home in just about twenty-five minutes (plus two hours of inactive time in the fridge). And one batch yields at least two times the cheese for half the cost. Rest assured, making the cheese at home is not one of those DIY projects where halfway through it becomes impossible to finish. 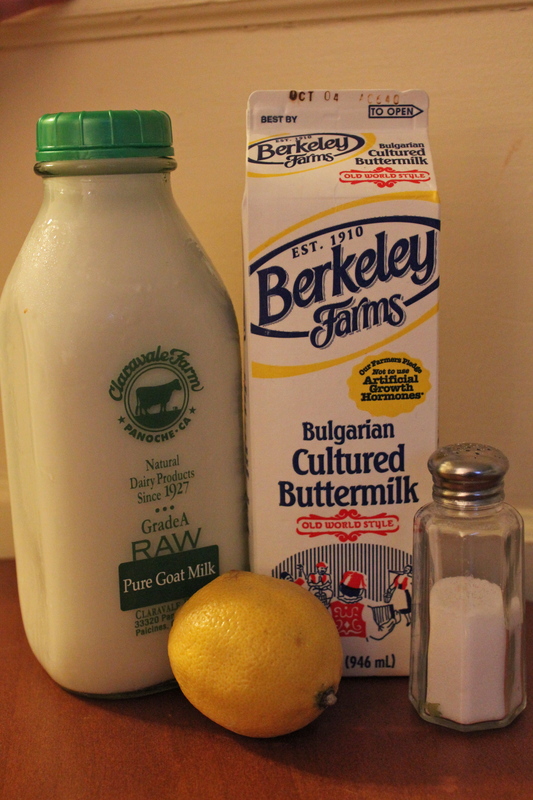 The recipe list is simple: Goat’s milk, buttermilk, lemon juice, and salt. Do not bother using low fat goat or buttermilk either, the integrity and texture of the cheese is ruined with such a lack of fat. While that smooth, creamy taste may suggest copious amounts of fat, it is just an illusion; even with using full fat milks, goat cheese is still actually lower in fat than most cow cheeses. Andronico’s is the best place to buy goat milk because they sell it in its raw, unpasteurized form, which is optimal for making the cheese. However, in a pinch, pasteurized milk will do just fine, Trader Joe’s and Rainbow Grocery are just a few of the stores that carry it. 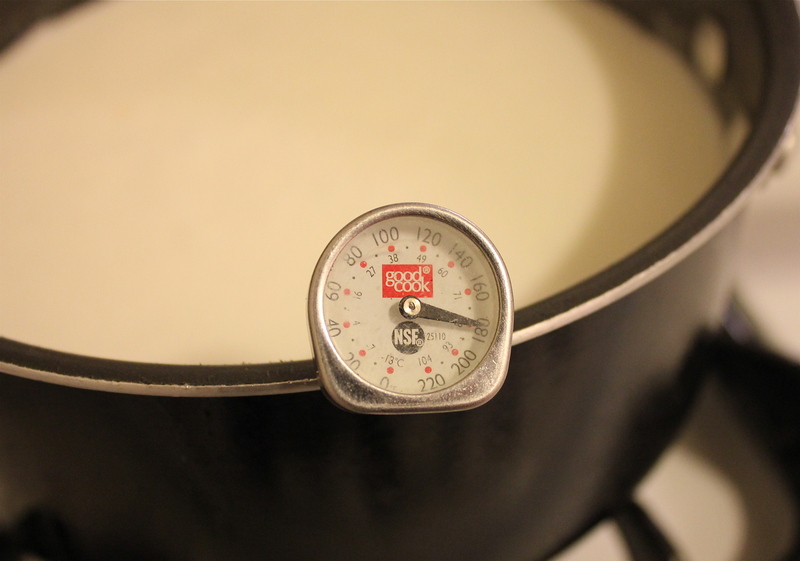 The process is just as simple as the ingredients; pour one liter of goat milk and one cup of buttermilk in a saucepan and let that heat up to 170-185 degrees – a word to the wise, a thermometer is needed for this. Once the milk reaches that temperature, turn the stove off and squeeze a tablespoon of lemon juice into it, stir, and watch it begin to curdle. This may be the most crucial part of the process, not enough lemon juice and nothing will happen, too much lemon juice and the mixture will over curdle and become grainy. So measure before pouring. Do not let pictures online fool anyone, not all curdles were born equal. Some will be big and float on top, while most will remain about the size of ¼ grain of rice and stay somewhere toward the bottom. Let the mixture cool to 120 degrees, stirring occasionally. Then take the whole pot and pour in through a cheesecloth-lined strainer that’s inside a larger bowl and marvel at all the premature goat cheese sitting there. 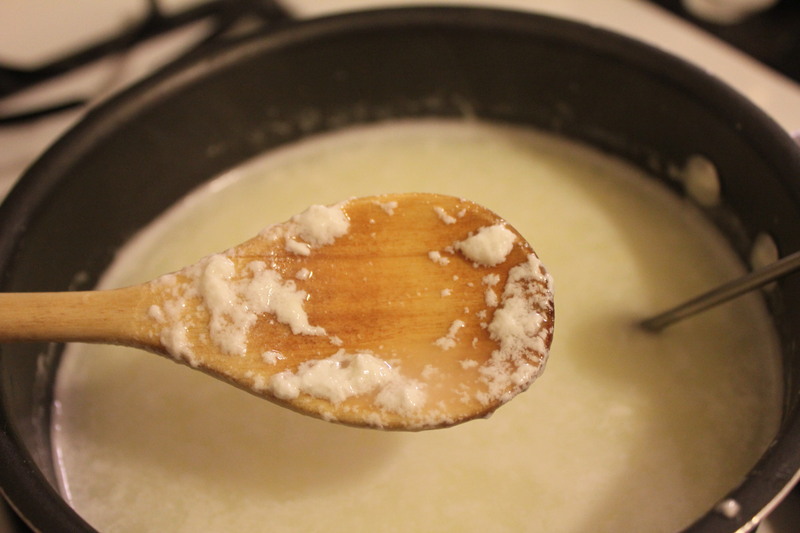 Strain it, like so, for about ten minutes, dump the excess liquid out of the bowl, then take the ends of the cheese clot, twist together and squeeze – not too tight. Secure with a rubber band, place back in strainer/bowl duo, cover with a small plate or bowl, and weigh down with a heavy can and pop it in the fridge. The cheese will continue to drain so the bowl is still essential. After two hours in the fridge, take it out and unwrap like the present it is. 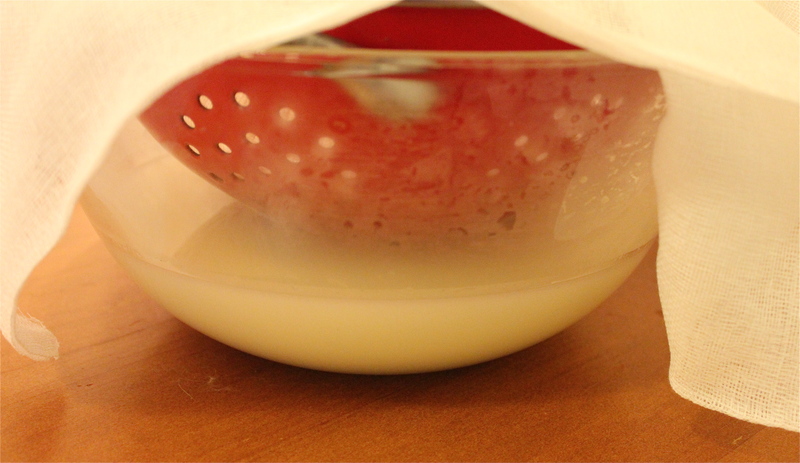 If the cheese is too crumbly, take the whey that was strained out in the fridge and fold it back into the mixture. This is a good time to add salt, non-iodized, to taste, the vital ingredient that extenuates the tartness of the cheese. Eat it with everything; the possibilities are endless. Goat cheese has had a long-standing place in history, even being referenced in The Odyssey, as goats were one of the first domesticated animals, nomads would turn goat’s milk into cheese, which served as the perfect way to preserve it. Their method of curdling the milk involved slaughtering a suckling calf and extracting rennet. 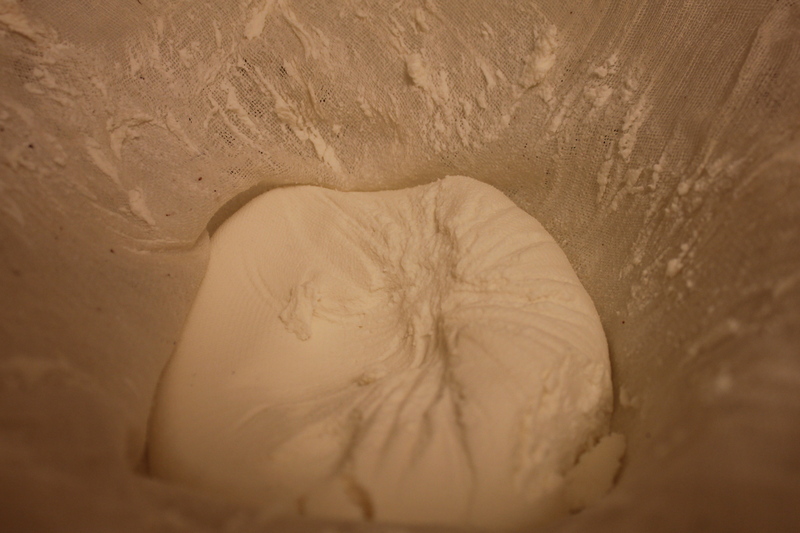 Today, more in depth recipes often call for rennet to be used in the process to ensure firmer curds, though most cheese shops in the city do not carry it. Purchasing it online, in tablet or liquid form, is the easiest route and the least expensive as it only costs about six dollars, comes in fairly large quantities, and can be stored for a long period of time. If thousands of years of homemaking cheese does not inspire confidence however, several shops around the city offer classes to help. 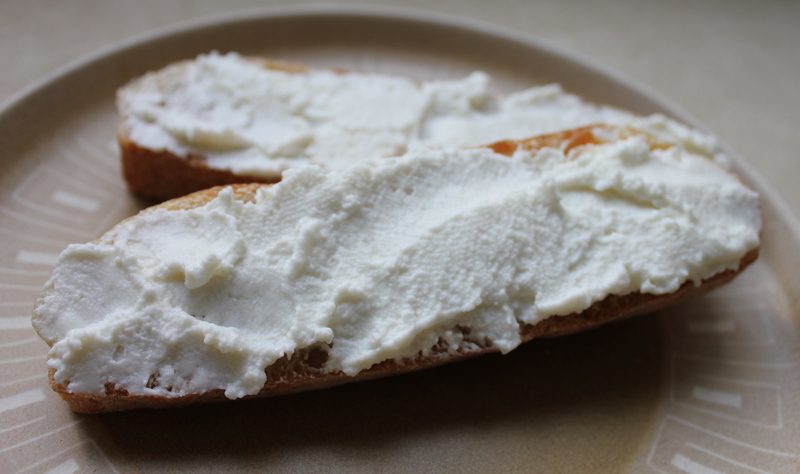 The Cheese School of San Francisco on Powell St. teaches both instructional and educational classes and the Workshop in the Western Addition hosts mozzarella-pulling nights every so often as well. Look out for classes offered by Say Cheese as they have also been considering passing on their cheesy whiz-dom. Spread on, fellow cheese lovers. This entry was posted in Uncategorized and tagged andronico's, buttermilk, easy, Goat Cheese, goat milk, healthy, juice, lemon, Love, making at home, quick, rainbow grocery, rennet, salt, say cheese, simple, trader joe's, whey by kristinakerley. Bookmark the permalink.